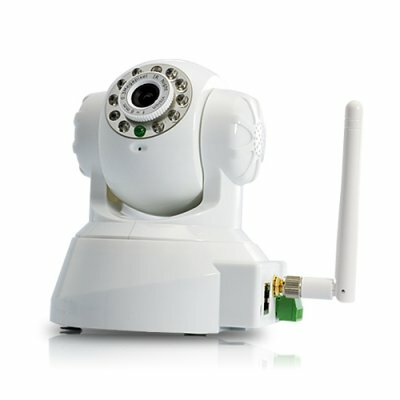 Successfully Added IP Surveillance Camera with Angle Control and Motion Detection (White) to your Shopping Cart. Are you worried about security? Then we have found the perfect peace of mind gadget available in the market today. This is an IP security camera that has it all. Night vision, email alert, motion detection, quad screen viewing, tilt and maneuvering functions with a click of the mouse. You can set up to 4 IP cameras and give each a static IP, then go online from anywhere in the world by visiting the IP address and login to start monitoring. Whether you're at an airport or a coffee shop, or you’re in Hong Kong, Paris, London, Barcelona, California, Moscow etc, you’ll be able to check the security status of your home or business from any computer in the world that has an internet connection. The WiFi feature on this global security camera with motion detection recording comes with a CMOS 1/4 inch sensor for providing you with a high quality image for over the web viewing and supports TCP/IP, DHCP, SMTP, TP, DDNS, UPNP network protocols. You can now truly say that you've got eyes at the back of your head. This powerful smart IP security camera with night vision and motion detection recording is in stock now, and available to you at a factory wholesale price. Click "add to cart" now and we will express ship out your order tomorrow. Good for dropship sales as well as internet storefronts. Records audio and video, so listen to what their saying even if they are hiding from the camera. on 2011-07-04 23:02:28 Very neat looking and works great. So far, it's working fine in our office LAN. The PDF manual included in the CD reads a little awkward and confusing but everything is quite intuitive. I also like the white casing. I tried it in low light condition (turned off a few lights but not all) and the video still comes out pretty good. I still have to try the other features but I'm excited at the possibilities.